Mssachusetts approved recreational marijuana in 2016. LEICESTER, Mass. — Customers waited in long lines, sometimes for hours, on a cold and rainy New England day to be among the first people to legally buy recreational marijuana on the U.S. East Coast. More than two years after Massachusetts voters approved of legalizing marijuana for adults, the state’s first two fully licensed pot shops opened Tuesday in Leicester and Northampton, selling strains of the part of the plant that can be smoked; pre-rolled joints; and edibles such as brownies and chocolate bars. 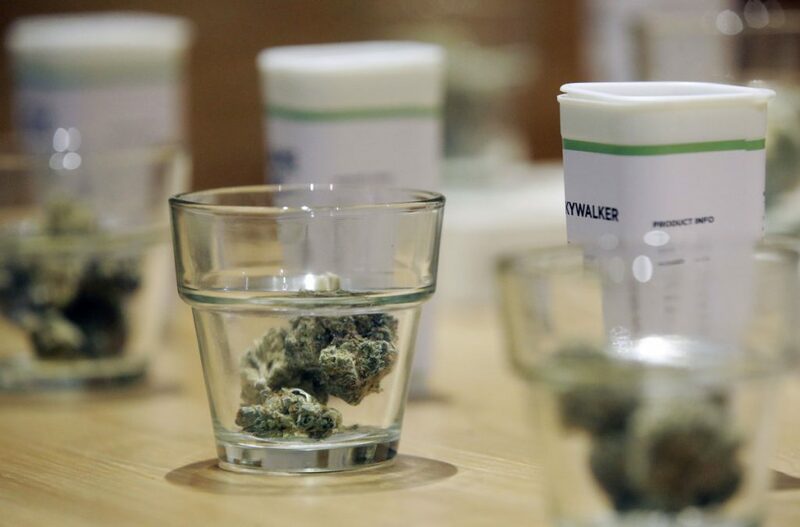 Marijuana is already sold legally in six Western states, but the long-awaited opening of recreational outlets in the East was hailed as major milestone for the cannabis industry in the U.S., with Massachusetts viewed as a potential $1.5 billion-a-year market. Canada began legal sales last month as well. Maine has legalized recreational marijuana, too, but is still working out rules for retailers and stores are not expected to open for many months. Five companies are vying to become Maine’s state marijuana consultant, including two that helped Colorado and Washington state create their adult-use programs. Meanwhile, a celebratory atmosphere ruled outside Massachusetts’ new shops, with buyers undaunted by the grim weather. Cheers went up when the stores opened at 8 a.m. sharp. One man, who dubbed himself “Potsquatch,” arrived at the Northampton store adorned from head to toe in a leafy marijuana costume. Customers were shuttled to Cultivate, the Leicester store, from a parking lot about a mile away as police kept a visible but low-key presence outside. Kenny Boisvert, a 33-year-old Blackstone resident, was pleasantly surprised by his purchasing experience. “It’s a very nice place. It’s way more than I expected,” he said as he waited to pick up edibles and buds. There were no immediate reports of product shortages at the stores, something that has plagued the initial start of recreational pot sales in some other states. Massachusetts’ top marijuana regulator said the crowds appeared orderly and praised operators for doing a thorough job of preparing for the first sales. “It’s only two stores but it represents, I think, a formidable accomplishment,” said Steven Hoffman, chairman of the Cannabis Control Commission, noting the panel started meeting only 14 months ago. Some legalization advocates have been critical of the slow pace of regulation and licensing by the state, while others have faulted cities and towns for throwing up roadblocks to marijuana businesses, or in some cases banning them altogether. The commission issued final licenses Tuesday to two more retail stores, in Salem and Easthampton, which could open in the coming weeks. But as yet there are no pot shops in the greater Boston area, where more than half the state’s population resides. George Graham, of Shelton, Connecticut, told Masslive.com he drove up Monday and got in line early at the Northampton store after spending the night at a nearby motel. “Everybody is happy to celebrate. I think it’s going to open the door to freedom for a lot of people in surrounding states,” said Graham, who is registered to use medical marijuana in Connecticut but is hoping his state will legalize recreational pot. Democratic Gov.-elect Ned Lamont of Connecticut supports legalization and hopes it will be a priority for state lawmakers next year. Rhode Island Democratic Gov. Gina Raimondo has also said she is open to legalization. Daquaan Hamilton, a 22-year-old student at nearby University of Massachusetts-Amherst, was among the first inside the Northampton store after beginning his wait shortly after midnight. “There are a lot of people throughout our history who have done prison time for such minor offenses – like having weed paraphernalia, or having small amounts on them – and the fact that I can walk out of the store right now with this and not be afraid of anything that can happen to me, it’s pretty great,” Hamilton told The Boston Globe.